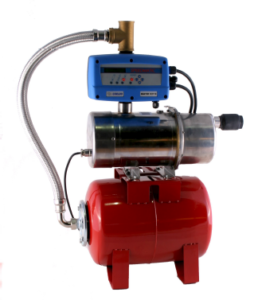 CBV series pressure booster sets are a compact, quiet and reliable solution for domestic and light commercial pressure boosting. A variable speed inverter runs the pump at the correct speed to maintain the desired pressure with low noise and power consumption. Large 24L pressure vessel increases efficiency and prolongs pump life. Automatic dry run protection, with periodic restarts. Current and pressure sensors integrated into the control unit. LCD status display, shows pressure, fault status and other operating parameters. Hour and start counter, alarm/fault logging with BMS output. Two booster sets can be connected together for increased flow and will operate as duty assist/standby with alternation. Anti Ice System detects temperatures below 5oC and performs periodic starts to avoid freezing. Short circuit and overcurrent protection between output phases. Quiet, water cooled pumps are self-cooling without the need for fans or ventilation. Suitable for installation in confined spaces. Supplied with 10m mains cable. Longer lengths are available.